Our Commercial Locksmith services ensures that the clients commercial establishments are secure and safe. This enables the business owners to focus on running their business successfully instead of having to worry about the safety and security of their business premises. When it comes to the safety of your commercial establishment, it is always advisable to go with the most reputed and experienced locksmith service providers. When you call us, our experienced technicians will assess your security needs and suggest the best options that are available, as per your specific needs and requirements. Jerusalem Locksmith Commercial Locksmith is the best when it comes to locksmith services in Jerusalem and its surrounding areas. The customers are not charged extra for any service and the prices are reasonable. One of the important things you need to remember is that the actual cost of the repairs and replacement can be decided by the expert technician only on inspection of the lock system. The locksmith technicians will give you the exact cost of the repairs before starting work. This ensures that you are aware of the cost and are not charged extra. Avoid cheap locksmith services as they don’t hire trained and certified technicians. The advanced lock systems require special skills and expertise to install and repair them properly. Untrained technicians can easily damage the lock system and it can be expensive to fix. Single Cylinder Deadbolt – The single cylinder deadbolt lock has a keyhole on the exterior side and thumb turn lock on the interior side. This means you don’t need a key to open it from the inside. In case of an emergency you will be able to exit the business premises easily. Double Cylinder Deadbolt – The double cylinder deadbolt lock has a keyhole on both the interior and exterior side of the deadbolt. This provides extra security. This can make it difficult for intruders to get inside your business premises and ensures that it stays safe at all times. Emergencies can happen anytime and you will require quick response from locksmith services. This is especially true if the emergency happens at night. When you call us, we respond to your emergency call immediately. The mobile locksmith service is located locally and this ensures that we can reach the specified location within minutes. The experienced locksmiths arrive in clearly marked vehicles with advanced tools and equipment needed to install and repair any kind of lock system. High security locks are resistant to forcing, drilling and picking. This makes them an ideal choice if you want to enhance the security of your business premises. The advanced lock system need special skills to install them properly. If the locks are not installed properly they can compromise the safety and security of your business premises. 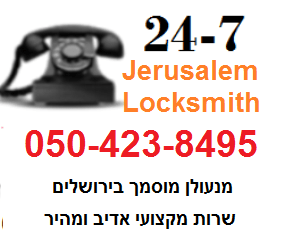 The team of locksmith technicians at Jerusalem Locksmith provide exemplary customer service. Call us today to schedule an appointment as per your convenience. You can also call us to get a free quote or talk with our experienced locksmith technicians about your specific security needs. Call us now for all your commercial locksmith needs.